Here is an unusually calm moment in our dining room, before we start our busy day. This entry was posted in 365 photo project, Black and White Photography, Morning Light, Photography, Reflections, Summer, window light and tagged 365 photo project, available light, © Jean H. de Buren, black and white photography, dust, morning light, natural light, Nikkor 50mm 1.4 G, Nikon d90, table by Keep Opening Doors. Bookmark the permalink. 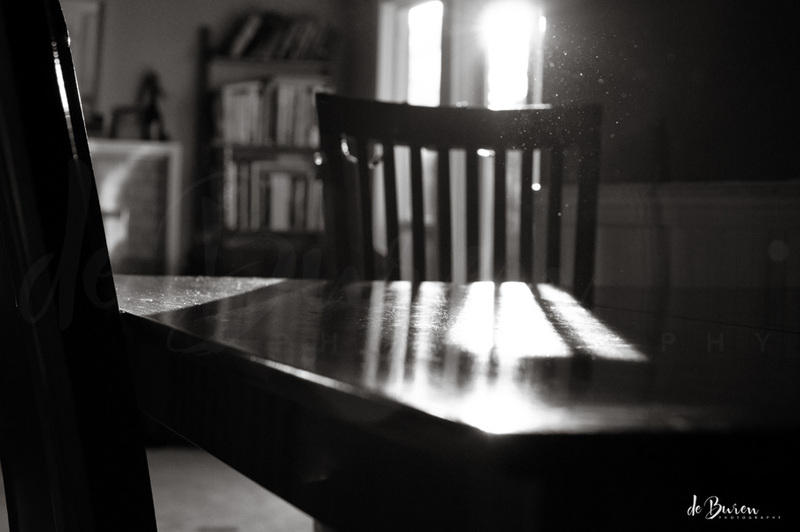 I love this shot, and especially that hint of dust in the air lit up by the sunlight coming in through the window! Such a simple composition, but this works great!! Thanks! It seems silly to admit this, but the dust is one of my favorite parts of this photo. Not at all, I thought that too… adds a bit of life to the image! A wonderful photo: both deeply peaceful and very interesting.